Thrifty and Frugal Living: Do You Know America's Most Amazingly Energized Woman? 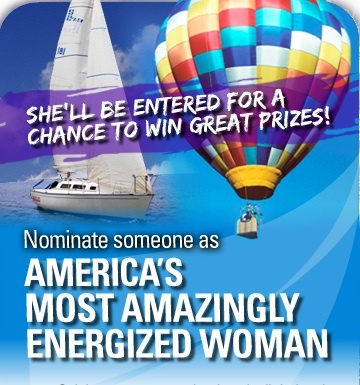 Do You Know America's Most Amazingly Energized Woman? 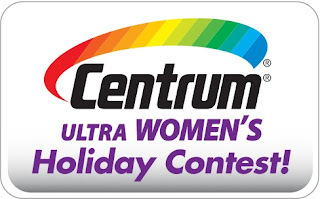 Centrum Multivitamins and Molly Shannon are on a search for the Most Amazingly Energized Woman and you can help but nominating yourself or someone you feel deserves to win (of course, there are great prizes involved!). They are looking for someone who live life and love to the fullest by staying healthy and energized, even during the busiest time of the year. Go to LoveFeelingHealthy.com and submit 300 words or less that explains how you (or who you nominate) does it all. Nominations are being accepted until January 2, 2011 (12pm EST). XPERIENCE DAYS offers thousands of unique gift experiences nationwide. Disclaimer: this contest is brought to you because I am a One2One Network Member. I will be entered to win gift cars in exchange for posting. I was compensated in no other way. Good luck!